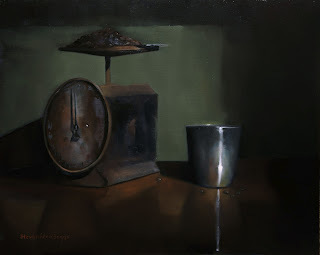 This is a old metal scale, a pewter cup, and coffee beans. The scale came from the barn of a doctor friend and is probably very old, an antique I suspect. When I saw the scale it set the color scheme for the painting, lots of rusty earth tones. I really liked the light and the overall feeling of the composition. I hope that you enjoy the painting!